With the worst of the cold out the way, it’s a blessed relief to turn our attention to the warmer months. This week’s SS18 Menswear review is packed with brilliant new Spring/Summer styles from some of our favourite brands. From vintage denim shorts by Italian masters Deisel, to an iconic laurel wreath sports bag by Fred Perry, we hope you’ll fins something to suit your tastes. Use the offer code SPRING18 to claim a 10% discount on all SS18 Menswear at Apache. We’ve been stocking Diesel jeans for nigh on 20 years, such is the consistent quality of this famous Italian brand. 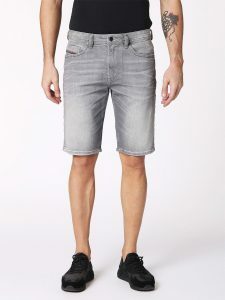 As you’d expect from Diesel, their new denim short boasts all the quality of their regular jeans: the classic wash in Grey (pictured) and Light Blue has a vintage denim look. The slim-fit short is made with jog jean jersey stretch fabric for a bit more comfort. Pair it with one of our new T shirts for an unbeatable Spring/Summer look. Farah can always be relied upon for eye-catching T shirt designs, and their SS18 Menswear range is no exception. The printed pattern is influenced by camouflage traditions, with a gorgeous medley of dark blues and greens. If you fancy a brighter, lighter version, then check out the same T shirt in Balsam. T shirts go with pretty much everything, although our preference is to pair it with some smart chino shorts. 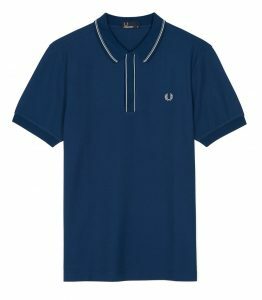 You already know about Fred Perry’s iconic Twin Tipped Polo Shirt — it’s an Apache staple. For Spring Summer 2018, Fred have come up with a twist on this classic design with a twin tipping on the placket and plain ribbed cuffs. Unlike the original polo, the buttons are covered by the placket. The pique cotton fabric is distinguished by a gorgeous honeycomb weave, soft to the touch and delightfully cool against the skin — no summer sweating with this garment! Now available in Deep Blue (pictured) and British Racing Green. 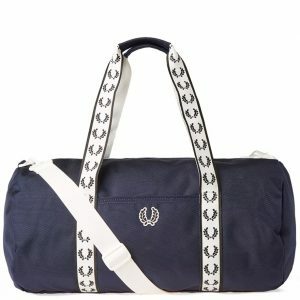 Fred Perry’s barrel bags are among the most popular accessories at Apache. They’re perfectly sized for a weekend away, a visit to the gym, or even to carry your work stuff. Featuring handy pockets inside and out, and an adjustable shoulder strap for all heights and body types. The high shine poly fabric is stylish and tough, and you won’t have to worry about attracting dirt or dust. This sports bag comes in three new colours: Navy (pictured), Ivy and Maroon. That’s all for this week; we hope there’s enough to fire your imagination. Don’t forget to use the offer code SPRING18 to get 10% off all new SS18 Menswear in our online store. 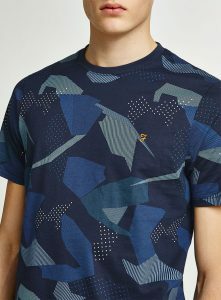 NextSave 10% on Farah SS18 Menswear!